There is a microphone switch ( which is on the left wire ), make sure the switch is turned on the ON condition. Rotating the volume controller ( also on the left wire of the headset ) to control the voice as your need. Please kindly note that there are two connectors at the very end of the wire, 3.5mm plug is for mic and headphone; the USB plug is for light. LED light highlight the game atmosphere (USB interface only for power supply to LED lights). Please check if the plug is well inserted into the interface device. With the bisected adapter cable of 3.5 mm interface, you can use the 3.5 mm dual plug(microphone and headphone jack)interface of the computer. Enjoy the music and voice chatting at the same time. Ensure that your audio devices work properly and sound switch has been turned on. Turn up the sound volume level, Ensure connecting the plug of headset to audio source correctly. how to use headphones with xbox one? If you want to use it for xbox one, a 2-in-1 adapter (not included) is needed.Please note you need an extra Microsoft Adapter (Not Included) when connect with an old version Xbox One controller. 【 Universal compatibility 】 support, PS4, Xbox One, PC, Nintendo 3DS, PSP, Laptop, Computer, Tablet, iPad, mobile phone. An additional Microsoft adapter is required (not included) if you have a connection to any version is made Xbox One Controller. 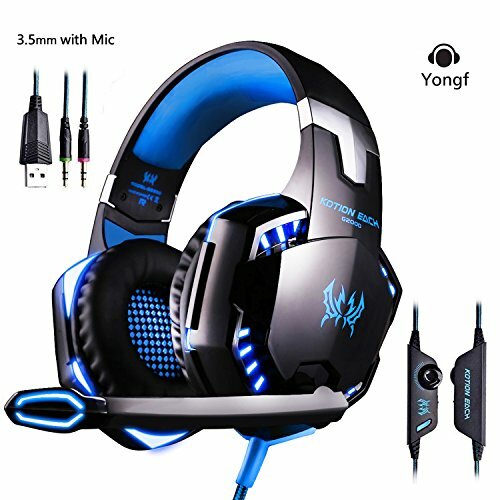 【 crystal clear sound 】 built-in industry leading high precision 50 mm magnetic neodymium driver pursues a more immersive experience, the omnidirectional noise reduction technology ensures that microphone picks up your voice clearly in game or online chat. 【 perfect for games 】 inline controls allow easy to adjust to the Stummschalttasten and volume control directly at your fingertips, shiny LED lights give a feeling of atmosphere in game play. 【 humanized design 】 The retractable design with faux leather wrapped headband ear cushions will allow you to hours of in full comfort to play and adjustable headband for all players of all ages. 【 reliable quality 】 Heavy Gauge Material Construction and high tensile strength are suitable for all species of contusions, knocks or falls bearable, will not deform after distortion 2.2 m (durable braided wire is resistant for long service life. If you have any questions about this product by Yongf, contact us by completing and submitting the form below. If you are looking for a specif part number, please include it with your message.